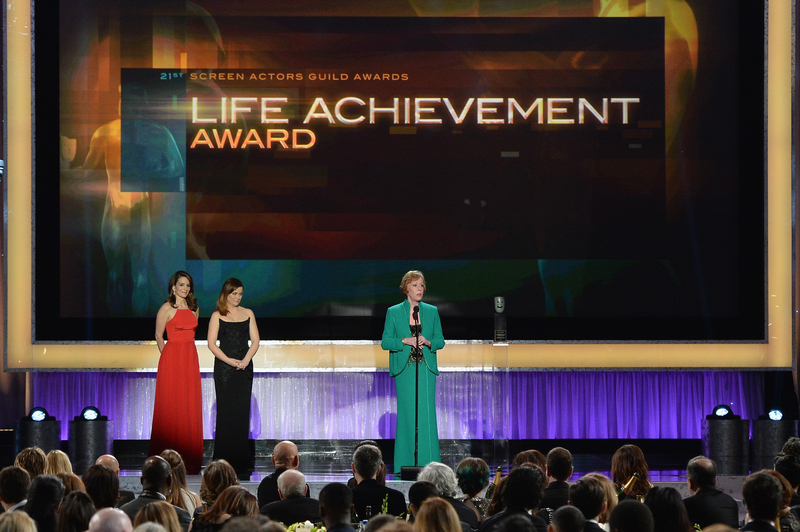 We missed them hosting the Golden Globes, so when Amy Poehler and Tina Fey presented Carol Burnett with the Lifetime Achievement SAG Award, it almost felt as if this award's season had finally begun. The theme? "Comedy is much harder than drama," the duo joked. From Fey's joke that the movie Carol is secretly about the actress' friendship with Julie Andrews — "watch it again," she insisted, to Poehler telling us that we all needed to cool it with Leonardo DiCaprio and The Revenant, partially because Carol Burnett would have done it better and funnier, their speech was such a tease. It was just the take I wanted on this year's nominated films, but not nearly enough of it. However, they were here to honor a comedy legend, and that they did. Carol Burnett has inspired almost every working comedian with her work as a performer, writer, and television hostess. "The point is," Poehler summarized, "Carol is better than all of us. We're gonna give her a prize for it." The career montage that followed included interview clips from other female comedy greats Betty White, Jane Lynch, and Ellen Degeneres. Burnett was then escorted to the stage by none other than Steve Carrell. Not too shabby! "You guys are the whole ball of wax," Burnett said to Fey and Poehler — which made them cry and that made me cry. We were then treated to Burnett's "life story," as she put it, which ranged from tales of her success as a woman in the comedy variety industry, to tales of climbing the Hollywood sign as a child. "The Os were my favorite. I loved the Os." The last thing that Burnett did was tug on her ear — which is something she always did at the end of The Carol Burnett Show — it's a shout out of sorts to her late grandmother and daughter, which was a lovely way to cap off a lovely celebration of a living legend.